The United States on Monday warned Syria not "to even consider using chemical weapons" after Damascus threatened to employ its unconventional arms in the case of outside intervention. 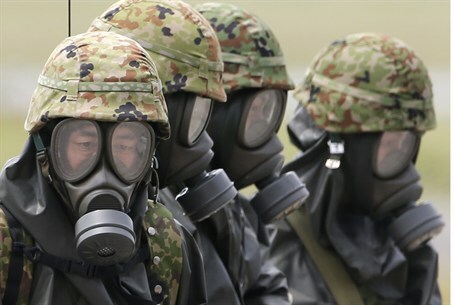 "They should not think one iota about using chemical weapons," Pentagon press secretary George Little told reporters. "We have been very strong in our statements inside the US government on the prospective use of chemical weapons and it would be entirely unacceptable," Little said. His comments came after Syria acknowledged it has chemical weapons and said it would use them if attacked, though not against its own civilians. The warning by Syrian foreign ministry spokesman Jihad Makdissi comes as Syrian president Bashar al-Assad finds itself fighting desperately pitched battles in Damascus and Aleppo with rebels. "When chemical weapons are mentioned in the press by Syrian officials, that raises concerns," Little said. "We would strongly object -- to put it mildly -- to any thinking that would generate a motivation on the part of the Syrian regime to employ these weapons," he added. The White House said on Sunday that the United States would "hold accountable" any Syrian official involved in the release or use of the country's chemical weapons. Little's remarks come on the heels of a round of meetings between Israeli and US officials on Monday over the deteriorating situation in Syria. Officials in Jerusalem and Washington are concerned Syria's stockpiles of chemical weapons and advanced weapons systems could fall into the wrong hands should the embattled Assad regime collapse. Defense Ministry official Amos Gilad said the Assad government remains in control of its chemical arsenals at this point. Over the weekend, Israeli officials made it clear that Israel was readying options if that changes. Israeli Prime Minister Benjamin Netanyahu warned Sunday that his country would "have to act" if necessary to safeguard this arsenal from rogue poachers, like Hizbullah in Lebanon. Measnwhile, Israel has lodged a formal complaint with the United Nations over an incursion by some 500 Syrian soldiers and 50 vehicles into the Golan Heights. Also on Monday, mortar fire on the Syrian side of Israel's northern border caused alarm in nearby Israeli communities who initially believed they were under attack. IDF officials assured the public they remain vigilant and are keeping careful tabs on events that could impact the security of Israeli civilians.